Spies! Romance! Mystery! Yaks! It’s All Happening in The Dream of the Turquoise Bee! In 1959, renowned French photojournalist Girard Pelletier disappears in Tibet. His colleagues believe he was murdered, as it is known he was writing a book about the Chinese takeover of Tibet. 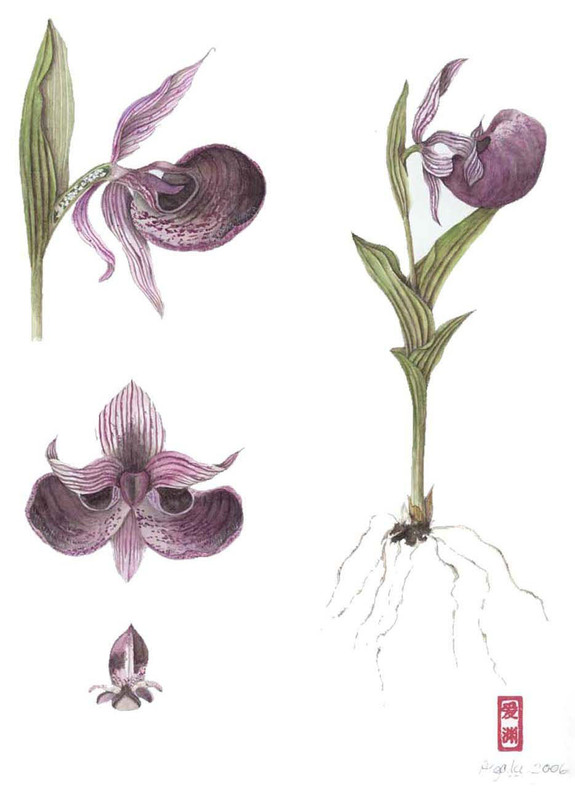 Years later his wife, Erzebet, a botanical illustrator, accepts an official invitation to join an educational exchange in the same region where Girard disappeared. She believes she will solve the mystery of his disappearance. The scholarly mission is a ruse. 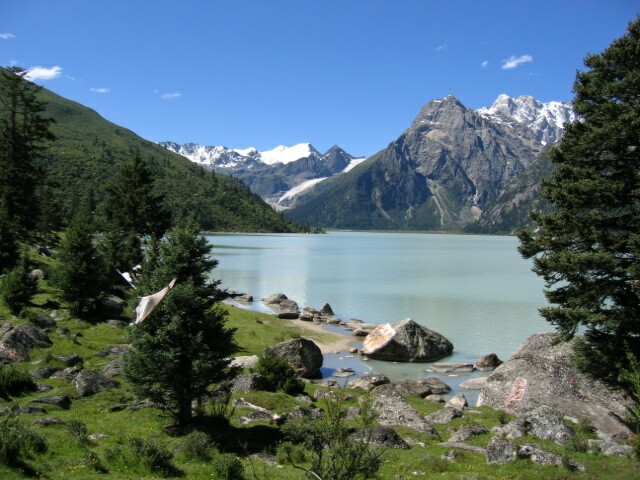 Erzebet has been set up by the Chinese Government. What appears to be a scholarly quest evolves into a twisting tale of the police, forbidden romance, dangerous adventures, and personal obsessions played out against the backdrop of the spectacular landscape, exotic people, wildlife and flowers of Tibet. A rich and powerful novel that combines romance, mysticism, and politics in the mysterious world of Tibet. A thrilling and intelligent story unfolds as artist and botanist Erzebet Pelletier sets out to find wildflowers — and to discover what happened to her journalist husband who vanished years earlier as the Chinese moved into Tibet. 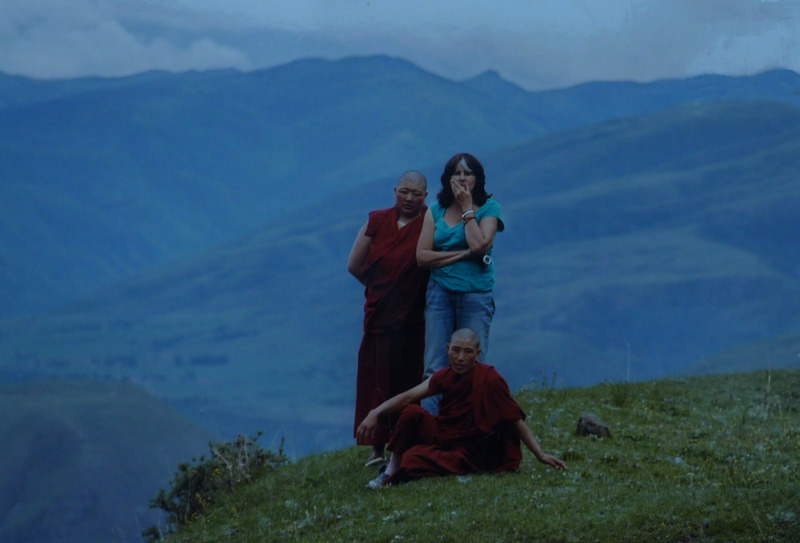 Dianne with nuns on a mountaintop in Kham–musing about the future of Tibet. 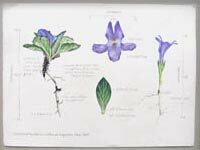 I wanted to tell the story and interlace it with my work in botanical illustration on the Plateau (I’ve got 58 paintings so far, with another 50 to go) , so that’s in there, too, as Erzebet Pelletier, a French botanical illustrator, travels to Tibet to solve the mystery of her husband’s disappearance. And of course, what is Tibet and what is a botanical illustrator in Tibet without the stunning display of the the Tibetan Blue Poppy to drive the turquoise bee wild? 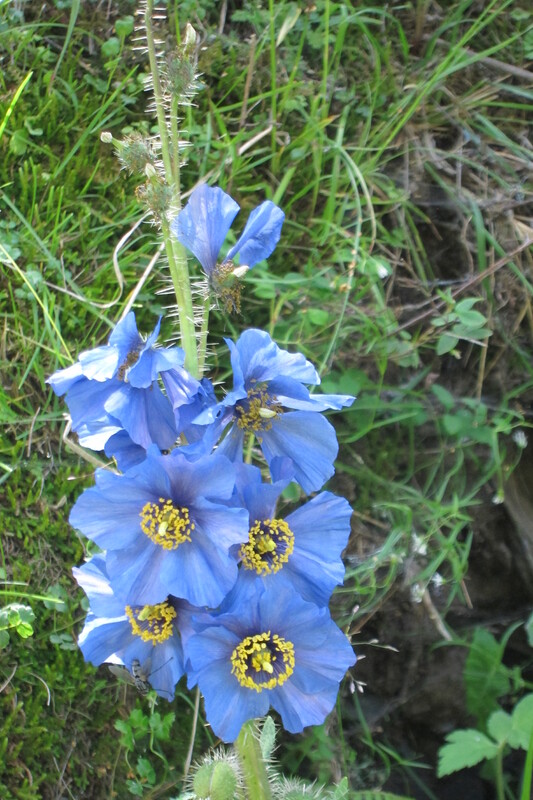 The stunning blue poppy with its fragile sapphire flowers and needle-sharp thorns–what a metaphor for love and mystery in Tibet. . .
Hope you love it and think of it as a great gift for friends and colleagues for the holidays and those reading vacations. 10% of the profits from all sales go to Tibetan support groups and projects world-wide, so while you kick back and dream of Tibet, you continue to give to our friends on the Plateau, too. The first set of profits will go to International Campaign for Tibet until January 15, 2013. 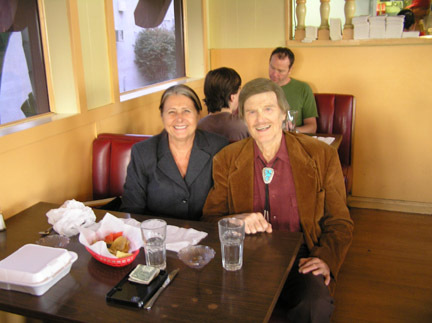 Dianne and John Goddard Eating Enchiladas in Southern California, December 28, 2007--A Fabulous, Inspiring Afternoon. #103 on the List-Check it Off! I first read about explorer John Goddard’s Life List in the early 1980’s. Immediately I knew it was a ground-breaking and heart-opening philosophy concept, and that it dovetailed perfectly with how I had lived my life since I was a child. I always believed that you can do what you love in your life and money will follow. That has been my experience my whole life. The Life List can be the vehicle that pushes and pulls you and elevates you throughout your entire life, whether you are 5 or 105. I began to facilitate workshops in the Life List in 1981. Hundreds of people attended, and I have introduced Mr. Goddard’s Life List concept to hundreds more over the years. Here are some of the comments from people before they wrote their lists, and afterwards. How does a Life List translate into a “real life”–what relevance could it possibly have to a “real life” where people have to work and pay the bills? Isn’t a Life List all about dreams—who’s got time for that in this day and age? Get practical! Am I doing myself, my spouse, or my kids a favor by suggesting that they create a Life List, or is this just encouraging them to spin them off into fantasy land when they need to buckle down and get to work on their real life? Yes, you may have made your Life List come true, but you were probably born with a silver spoon in your mouth! What does this have to do with me? I was afraid to write my Life List—and was actually trembling with anxiety when I started. I wrote and wrote and wrote. I thought I would have 5 items—instead I had 87 when I finished. Some of these I had been afraid to tell another soul—for fear they would laugh at me for being in a fantasy world. When I looked back over my list at the ed of the afternoon, I was elated. There wasn’t a thing on it I couldn’t accomplish in my lifetime—they weren’t fantastical visions at all. I showed it my friends, my brother, my friends, and even my boss-there wasn’t a single person who laughed at me. In fact, every one of them wrote their own list the very day they saw mine! The day I wrote my Life List, my world changed—before I even started to get to work on it, my life was brighter. I can’t believe how many things I wrote on my Life List that have now come true—as if the energy were magnetized to make it happen just by my writing it down, without me doing anything at all. The Life List exercise shaped my life—from the first day. I saw right in front of me every dream I had had as a kid and as a young adult—and better yet, I saw they were still possible. I’m a goal person. I wrote my Life List and suddenly had a chart of my greatest dreams. I started within five minutes to put the details in place to make them happen, and within weeks was checking items off—hopes that had been sitting in the back of my mind for decades. My husband, my teenage son and I came to the Life List workshop together. We all think it was the day our lives changed for the better. We walked into that workshop feeling like we were each living in little boxes and out of there laughing and exhilarated by what lay ahead. Here is my list. I have to admit, it feels a little scary to put it out there for not only friends and family, but perfect strangers to read–but in the spirit of this blog, here I go! I’m going to throw in a few photos at the end to show you what has come to my life via my Life List. I hope you find it interesting and are inspired to write your own. It’s never too late to write your List and start to live it. 47) Learn all the constellations (Added: 1970) Completed in 1972, most forgotten by 2007! 93) Have a giant rabbit Yes! 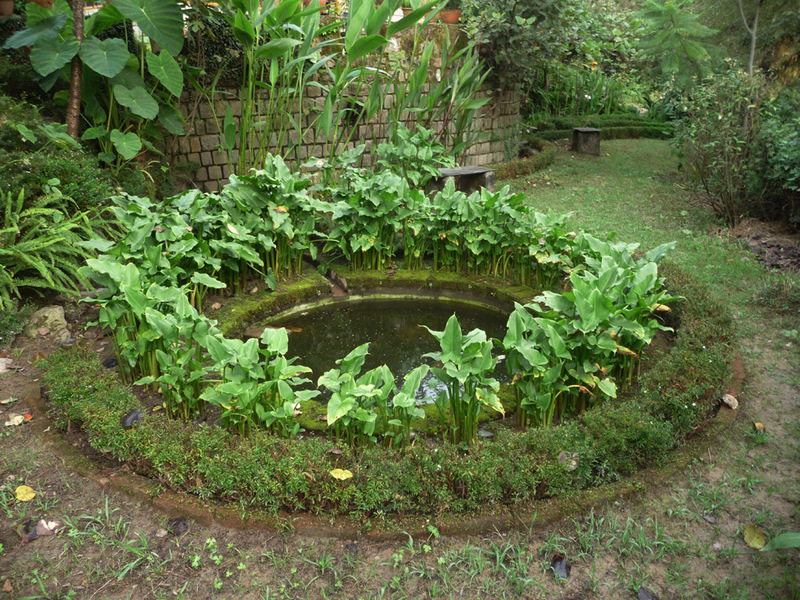 The Calla Lily Pool at My Home in India- #16 On the List-Check It Off! Map/Botanical Painting from the Voyage of the Endeavour Series- #57 On the List-Check It Off! Dianne with WINGS World Quest explorer Flag in Kham, Tibet, 2007-#29 On the List-Check It Off! 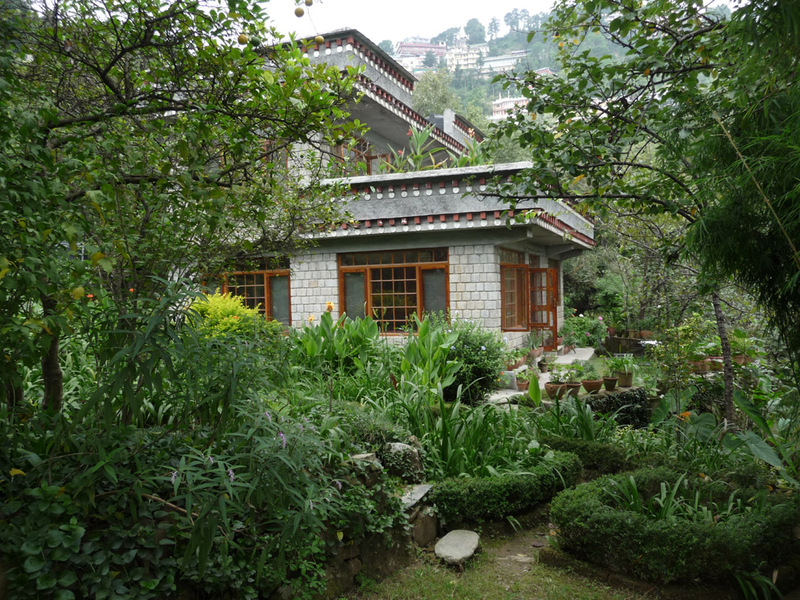 My Stone House in Dharamasala, India-Built in 1999- #13 On the List-Check It Off! More photos to come. Stay Tuned! Dianne Aigaki has led a multi-faceted life, working as a consultant to nonprofit organizations (training nonprofits worldwide in project development and writing solid funding proposals) and as an artist in various media. She lives part of the year in India, part in Mexico, and spends the summers in Eastern Tibet where she is completing a documentation project of wildflowers growing at 11,000-18,000 feet altitude and leading the Dream of the Turquoise Bee Tours to Kham. She is a well-known motivational speaker and has a multi-disciplinary approach to her work and presentations, tying in the botanical aspects to education, women’s exploration, cultural diplomacy, and environmental conservation. 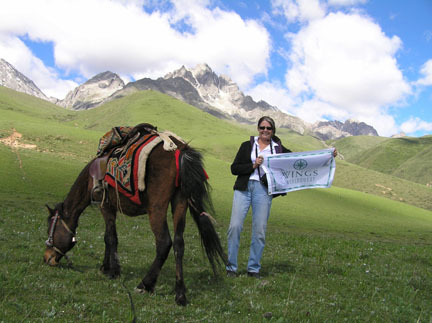 Dianne is a member of the Society of Women Geographers and WINGS WorldQuest, carrying the WINGS expedition flag into Tibet in 2007. The Aigaki Tibet botanicals (there are currently 47 paintings in the collection) have been exhibited at the Royal Horticultural Society in London (Bronze Medal), Queen Sirikit Botanical Gardens in Chiang Mai, Thailand, and the Minnesota Landcsape Arboretum in Minneapolis. Dianne is currently completing a novel called The Dream of the Turquoise Bee, a mystery that takes place in Tibet after the Cultural Revolution, and working on a series of paintings that follow the voyage of the tall ship the Endeavour around the world from 1768-1771. 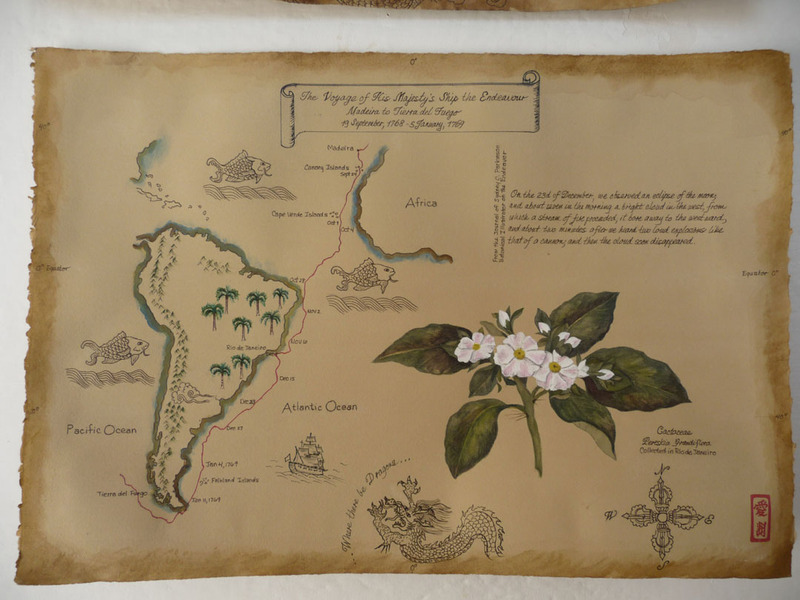 The paintings include maps that track the route of the Endeavour (Brazil, Tahiti, New Zealand, Australia and Java) , replicas of the actual botanical illustrations completed by Sydney Parkinson and passages from his diaries. Hi- I would love to have you keep visiting my blog. If you sign up here, I will let you know when I have new posts. Just enter your email address. Thanks so much.